I travel quite a bit aboard Amtrak trains all over the country. Sometimes it’s for one night, like from Florida to New York. Other times, I’m barreling across country on two-night train adventures, from Chicago to California, New Orleans to Los Angeles or even up to Washington state. But one thing is certain, I always have my own compartment and a cozy bed in a private sleeping compartment on Amtrak. 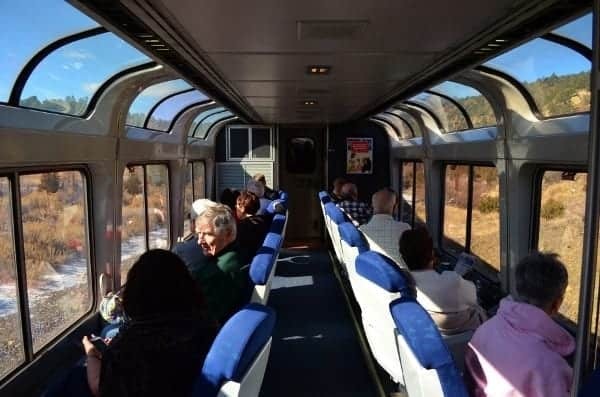 Amtrak’s Superliner observation car is open to all passengers. Whether you choose a roomette on an Amtrak Viewliner train or the larger bedroom accommodation on the Viewliners or thedouble-decker Superliners, all of your meals for the entire journey are complimentary. The same for bottled water, coffee and juice. Sometimes you’ll even find a morning newspaper was quietly slipped under your door by your car attendant, while you were still asleep. I’ve been traveling on the trains across America starting with the original Santa Fe Super Chief. So, without further ado or sounding like an advertorial for Amtrak, here’s my video from a recent trip aboard the Amtrak Capitol Limited heading to Chicago from Washington DC. And if you like my video, please subscribe to my YouTube channel. Yes, I’ve traveled between Florida and NYC many many times and won’t do it without a sleeper. If you’d need a car, try the Auto Train and you can get a sleeper on that train too. Thanks for sharing! I have never traveled by train, but that cabin would make it much more pleasant. Have you ever traveled to South Florida by Amtrak train?